Craig W. Relman of Ohio, represents businesses and individuals throughout the state in important legal matters pertaining to Bankruptcy and Creditors' Rights, business transactions, commercial collections, family law, estate planning and probate law. Our experienced lawyers have more than 50 years of combined experience in legal representation. We are tenacious litigators and persuasive negotiators who work hard to achieve our clients' business and personal goals. Our practice is small by design. We employ two attorneys and a support staff who respond to issues quickly and thoroughly. Retain our services, and we will listen to your concerns, discuss your options with you and help you come to the best decisions for your circumstances. We will keep lines of communication open at all times, responding to your inquiries in a timely manner. More specifically, we represent Creditors in the business, commercial and banking sectors by helping them recover money and property owed to their organizations. Our services include creditor-side representation in bankruptcies and advice, drafting, and review of legal documents in business and commercial transactions and litigation in commercial disputes. Our founding attorney, Craig W. Relman, is well-versed in the Fair Debt Collection Practices Act (FDCPA) and can keep your business operating within the law, while protecting its interests. We also represent individuals in family law matters, including contested and uncontested divorce, marital dissolution, legal separation, child custody and visitation, child support, alimony, post-decree modifications, post-decree enforcement, prenuptial agreements and asset division. Attorney James Schoen, routinely advises clients on creating Qualified Domestic Relations Orders (QDRO) that alter ownership of pensions and retirement plans. He also drafts, reviews and litigates on behalf clients in estate planning matters, including probate. 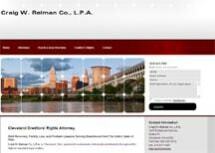 Craig W. Relman Co., L.P.A., offers a free, initial consultation to our prospective clients as well as evening and weekend appointments upon request. We also offer reasonable rates, flexible fee structures, and accept payment by VISA and MasterCard. To discuss your options, call the law firm at 800-569-1012. Spanish language translation is available. Servicios de traducciones disponibles. The attorneys of Craig W. Relman Co., L.P.A. represent banks, businesses and financial institutions and help them to recovering money and merchandise, even when the debtor has declared bankruptcy. The firm focuses on creditor-side bankruptcy, business and commercial transactions, family law, estate planning and probate.